Country Restrictions: BELGIUM, BULGARIA, CHINA, CUBA, CYPRUS, DENMARK, ESTONIA, DOMINICA, FRANCE, GREENLAND, HUNGARY, IRAN, IRAQ, ISRAEL, ITALY, LIBYA, PORTUGAL, SERBIA, ROMANIA, SINGAPORE, SLOVENIA, SPAIN, SYRIA, THE PHILIPPINES, THE NETHERLANDS, TURKEY,UKRAINE,UK, USA. Company: Europaplay is a brand operated by Universe Entertainment Services Malta Limited (C-60452). Europaplay is a brand operated by Universe Entertainment Services Malta Limited (C-60452). Universe Entertainment Services Malta Limited is licensed and regulated by the Malta Gaming Authority. Europaplay holds through Universe Entertainment Services Malta Limited the following licenses: MGA/CL2/963/2014 (issued: 20th July, 2015), MGA/CL3/929/2013 (issued: 20th July, 2015), MGA/CL1/929/2013 (issued: 27th October, 2014). Even though Europaplay Online Casino is but a mere infant when compared to the rest of the online gambling fraternity, it doesn’t mean that this particular online casino is not a force to be reckoned with. Unlike most startups who have to make their way in the world, Europaplay has the backing of one of the biggest names in the industry and is part of one of the most established casino groups in the world. This means they will not have any teething problems to work out and will be able to hit the floor running. We’ve had a look at the casinos offerings and to say we were pleasantly surprised, is the understatement of the century. The casino holds a licensed issued by the Malta Gaming Authority (MGA), which is widely regarded as one of the best regulating authorities in the world. The site is secured by the traditional Secure Socket Layer (SSL) data encryption algorithms, the same system used by many of the worlds leading banks and online payment companies. Europaplay also promotes safe gambling and is an active member of the Gamble Aware initiative that helps problem gamblers overcome their addiction. Playtech was the casino software company tasked with creating the software used by the casino, which includes all the games on the site, the casino lobby and the security of the site. 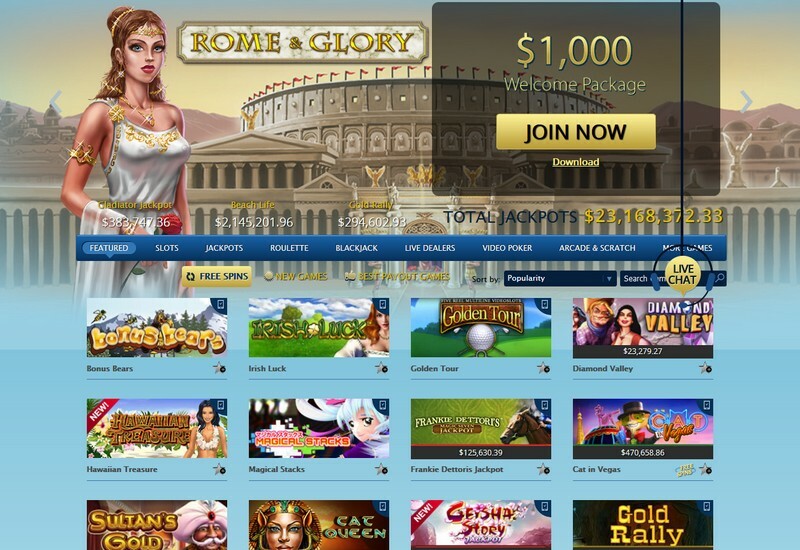 Thanks to the partnership between the two, the casino lobby runs seamlessly and navigation in the site is as simple a task as it could ever be. Playtech also supplied the casino with its portfolio of games which consists of well over 500 casino games to play. If there was one aspect that makes Europaplay stand out amongst the rest, it’s the wide variety of online casino games on offer. Among the casinos portfolio of games, you’ll find the likes of Slots, Progressive Games, Table Games, Card Games and even Live Dealer Games. You’ll also find many varieties of video poker machines to play and a few of the more obscure games that include the likes of scratch cards. The games have been designed and engineered to the highest standards which means they have amazing graphics and run seamlessly on all platforms. Visitors to the online casino will be pleased to know that there are many different ways to play the variety of games on offer. The various casino versions include browser versions, a downloadable casino, a mobile version for those that have smartphones and tablets and even a live dealer version that brings the casino experience to your house. The browser and downloadable versions have the full compliment of casino games to play but the mobile and live casino versions have a limited number of games. There is an enticingly varied array of online casino bonuses for you to enjoy should you pay a visit to the casino. Among them are the usual welcome bonuses, reload bonuses and even weekly loyalty bonuses that can be redeemed. As well as the standard ones, there is also an extremely lucrative VIP loyalty program that you can join. As it is with most online casinos, the more you deposit, the more you play, the more points you earn and the higher up the ladder you can climb. 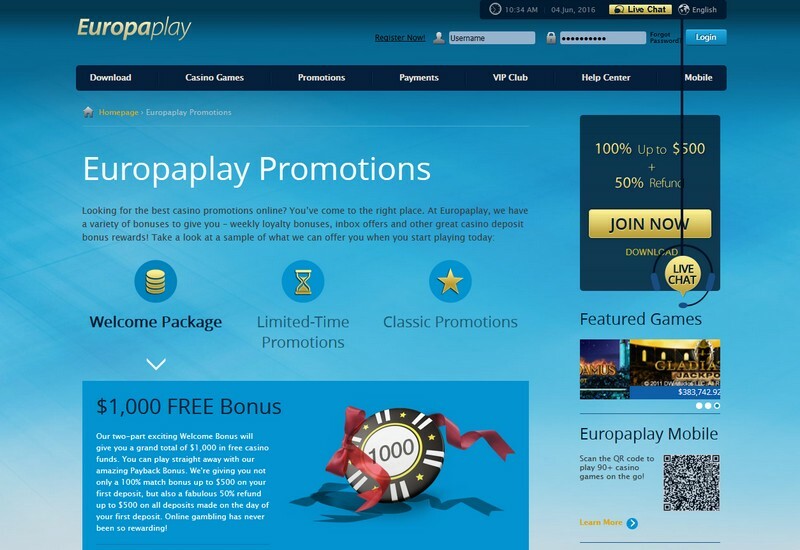 There are the usual perks for VIP players which include bigger bonuses and exclusive access to special promotions and events, but one thing that makes the Europaplay VIP program special is the faster withdrawal times for its VIP’s. The banking options provided b y an online casino is always one of the most important aspects to consider when choosing whether or not to play there. Europaplay, thankfully, can offer their members many different banking options to choose from and, depending on whether you’re depositing paying money or withdrawing winnings, you’ll be able to find a method that suits you best. Among the different baking options, you’ll find a variety of credit and debit cards, some web wallets and even direct banking methods that you can use such as bank transfers. All in all, the casino has made sure that they cater for everybody so you shouldn’t have any problems. 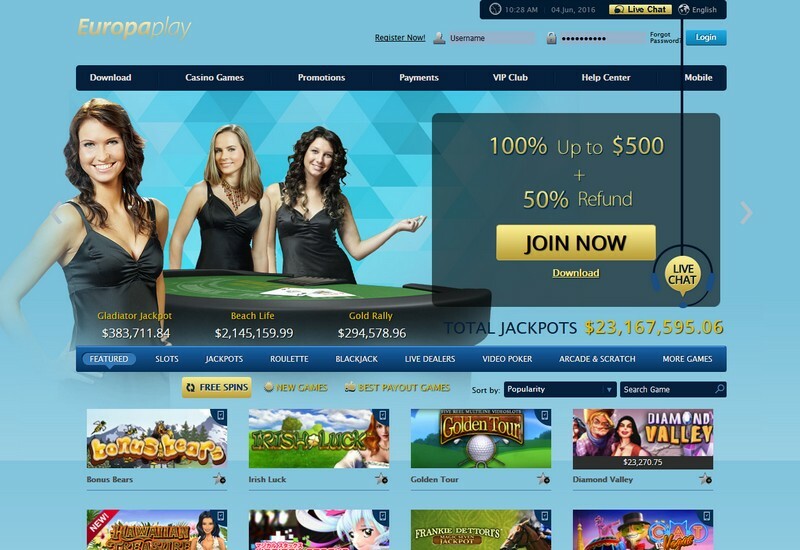 Usually, we at CasinoTop10 would wait before reviewing a new online casino but in the instance of Europaplay, we’re confident that their pedigree and management staff know what they’re doing. So far we’ve been nothing but extremely impressed with all the offerings and the professional way in which everybody at the casino handles their business. If you’re looking to play at an online casino, there aren’t many better than Europaplay and we highly recommend that you pay them a visit.